Owning your own business can be a lot of work, it’s true, but one difficulty that many people have when they start their own business is that they don’t realize all of the things that they are going to be required to do when they actually have their business. They believe in a hard work ethic, but many are surprised to learn about all of the things that you need to think about when you own your own business. You may, for instance, have seen a moonwalk for sale and have thought that it would be very simple to run a rental business. While it is actually a fun and worthwhile business to own, there are a number of small things that you should think about before beginning your business. One thing that may be surprising is that many people have a difficult time thinking about a name for their business. You’d think that naming the company would be the simplest thing, but in reality it’s actually one of the most difficult! So how do you get ideas for a name? Check out a moonwalk manufacturer website and you may get inspired. You may find that there are a number of words on the site that relate to a moonwalk for sale that you can use to help you to come up with a name. Don’t feel as though you have to put the business under your name, but keep in mind that if you do, it’s much less paperwork for you. Another problem that you may not think about when you’re looking at a beautiful moonwalk for sale is the insurance. It’s definitely a good idea for anyone who owns a moonwalk rental business to procure liability insurance. This insurance covers you in case something unexpected happens when the moonwalk has been rented out, and is definitely a good investment. Before buying a moonwalk, check into liability insurance and learn how much you’ll have to pay out for it. There are a number of companies who offer it, and it is often very affordable, but it’s certainly something to think about. A moonwalk manufacturer website can be very tempting, and while beginning a moonwalk business is actually fairly simple, there are a number of small things that you should think about before you begin the business. Remember: the more you think about these things before you actually buy a moonwalk for sale, the better off you’ll be in the long run. Hand-outs or flyers are a great and economical way to market your inflatable business. You can travel door-to-door with the flyers, attach them to cars or simply drop them off at high traffic locations in your geographic location, such as the library and local toy stores. Just one new customer and this marketing medium has more than paid for itself. A professional designed flyer can really make the difference in the number of leads, and ultimately customers generated. While color is a bit more expensive to print and reproduce, the quality is significantly higher when your flyer is in color. Similarly, a higher quality paper stock or glossy material will make your flyer stand out even more, presenting a professional image. Of course you do not need to spend this extra money to create a professional, quality flyer that will attract attention and generate inflatable business. Incorporate high, quality images into your flyer. The images will grab the recipients’ attention and entice them to read the information. Create an eye-catching headline. Consider who your target audience is and create a headline that will grab their attention and keep them reading. Focus on the benefits of your inflatable service. You should address your target audiences’ question “What is in it for me?” Also address the benefits of inflatables, and why your business’ services are superior to other inflatable businesses in the area. Beware of getting too fancy or creative with fonts. It is best to limit yourself to two fonts. Excessive fonts and the flyer will be too busy for the reader. Include testimonials. You may be able to include a testimonial sidebar in the design of your newsletter, or a “bubble” section with these testimonials. The flyer should be eye-catching with boxes, borders and shading. Be careful not to make this design excessive or too busy, but incorporate white space as well to make these other items stand out. Include you company’s logo to establish an even more polished, professional appearance. Make sure that you include a “call to action” at the bottom of the brochure. This should be either a phone number to call, website, email or all of the above. You may also want to include a coupon or special in the flyer. Utilize the software available. Whether you are a graphics expert using a professional program or a novice, most programs (including Microsoft Word) have flyer templates available to get you started. Proofread, proofread, proofread! Typos will make you look unprofessional and recipients may question the credibility of your business. Good luck with your inflatable business’ creative marketing efforts and happy designing! ‘The big “R-word”. It seems to be popping up everywhere lately, as the predictions for a “double-dip recession” abound. But what exactly does this mean for your inflatable business? Are you tightening the purse strings, cutting back on business expenses? Or have you had to cut back on staff, due to a decrease in business? When times are tight inflatable businesses need to trim the fat from their operating expenses where they can. And quite often significant cutbacks, or even entire elimination, are made in the marketing activities. While this does save money and improve your cash flow in the short term, the long lasting effects to your business can be catastrophic. When the economy begins to rebound your inflatable business may end up watching from the sideline, unknown to your prospects and forgotten by your customers. Competitors who have continued to market their own inflatable businesses during this downturn may have too strong of a strong hold on your target market, meaning potential devastation for your business. So what is an inflatable business owner on a tight budget to do? The easiest solution is to pare down your marketing to the most cost effective mediums, with the highest return on your investment. A simply designed flier, even in black and white, can be an effective marketing tool for the inflatable industry. Fliers can be dropped off at local hotspots to be used as hand-outs, tacked to community bulletin boards or simply dropped off door to door. The expense to create and distribute this is minimal, and the effort you put forth will continue to keep your name in the minds of your prospective customers. There are also plenty of opportunities to list your inflatable business on the internet, many of which are free or for a nominal fee. Take advantage of these opportunities as well. Email marketing is another economical way to reach your target audience. Whether you have your own customer list or are looking to purchase one, the cost is certainly budgetary. The reach of this type of marketing is also often quite expansive, with a very favorable return on your investment. While business is slow you may find that you have more time on your hands. Rather than twiddling your thumbs and hoping for the phone to ring try to come up with some more innovative (and free!) marketing ideas for you business. 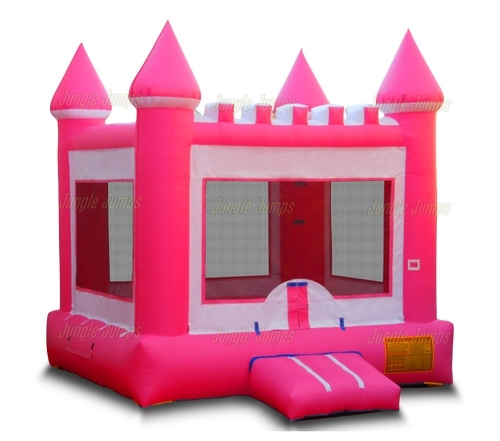 Consider offering your inflatables service to a local charity for no charge. Your product will be out in the public for the cost of your labor only. You can even take this type of opportunity to hand out business cards to the parents and visitors. This is typically something they will hold onto, particularly if you have put your best foot forwards, prevent and clean, safe activity and a professional business manner. While business may be down right now, the future is bright and you need to ensure that your business’ future is secure by continuing to market your inflatable business through good and bad economies alike.